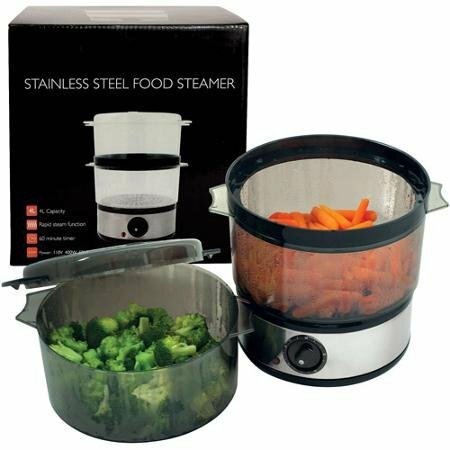 Improve your health by steaming your food with the American Originals 4-Quart Food Stainless Steel Food Steamer. Steaming helps retain valuable nutrients that are often cooked out by other cooking methods. This electric food steamer has a four qt capacity and 400W of power to steam in an hour or less to get your family to dinner quickly and easily. The two-tier food steamer features a timer that goes from 0 to 60 minutes and an automatic shut-off for safety. The removable trays and lids are dishwasher safe for quick and easy cleanup. You can steam using either one or two trays, depending on how much space you need. It is easy to get cooking with this electric food steamer; just add water and plug it in. This steamer can be used for vegetables, rice or any other items you might want to steam. This 2-Tier Food Steamer allows you to cook two items at once, saving you time. If you have any questions about this product by American Originals, contact us by completing and submitting the form below. If you are looking for a specif part number, please include it with your message.